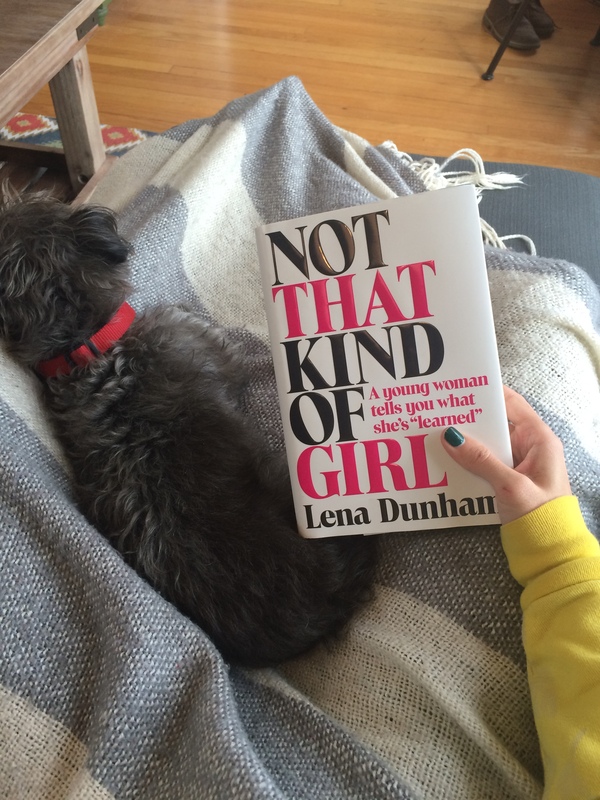 Reading: Lena Dunham’s Not That Kind of Girl. I’m almost done with the book and I think I still have mixed feelings about it. She’s received a lot of attention because of some specific passages and apparently had to cancel some book signings because of how they were received. I started watching her show, Girls, on HBO after seeing her film Tiny Furniture a few years ago. Most of the time, my reaction to her writing and to her show is somewhere between “omg this is a train wreck and I can’t look away” and cringing in embarrassment. That said, I think it’s refreshing that there is a show out there that portrays at least a few real life situations that 20-somethings have to deal with — even if it is a bit exaggerated. Next on my list of books to read? Wild by Cheryl Strayed (*finally* getting around to it!) and The Innovators by Walter Isaacson. I have them both on my iPad and now I just have to find the time to read them. Shouldn’t be too hard now that I’m not training, right? Decorating: Now that I’m not training and starting to feel like recovery is happening post-26.2, I suddenly have so much energy at the weirdest times. I go from being so sleepy to super energetic and back again. I have to do something with those spurts of energy and lately it’s been all about decorating and furnishing the apartment, two months after moving. I went on a cleaning rampage on Friday night and was going to go crazy if I didn’t hang some of our artwork and decor up on the walls. (Reverse taper crazy?) We finally decided on a look for the dining area & stumbled up on a customer furniture maker online, thanks to an ad he listed on Craiglist. 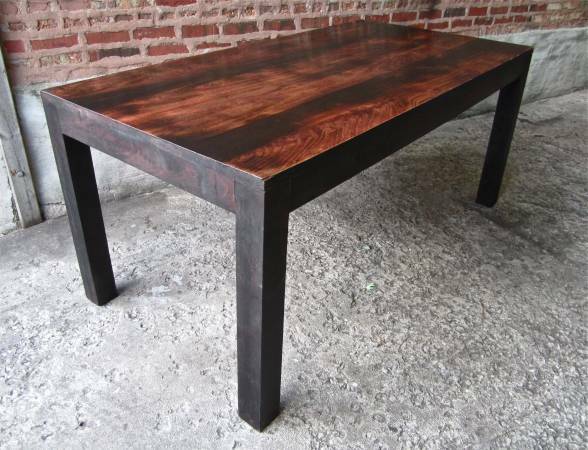 This guy has been great to work with and had us choose the wood, stain, and style of our custom dining room table. I’M SO EXCITED ABOUT IT! It’s going to arrive just in time for Thanksgiving. We’re going for the rustic, industrial look. …and an example of the table that is being built this week! 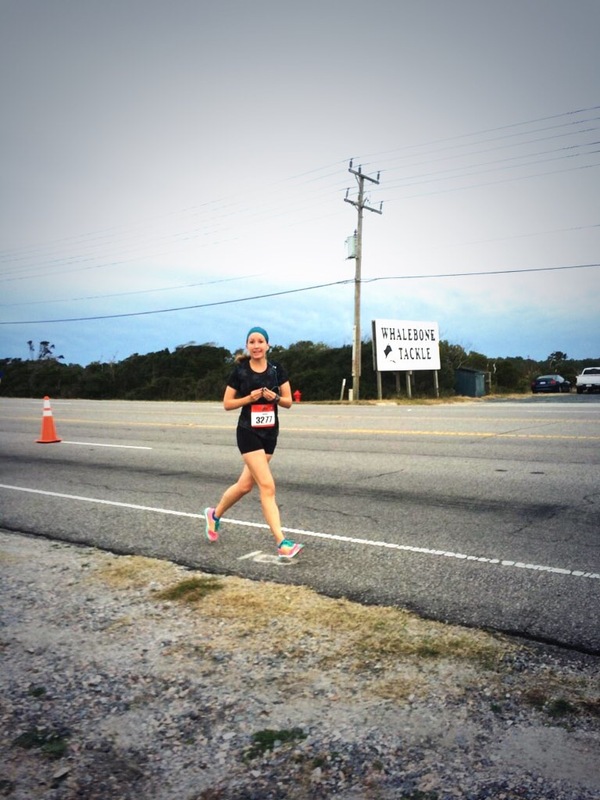 Can’t stop smiling about: My sister’s half marathon PR at Outer Banks this past weekend! I woke up at 7 AM yesterday when I heard my phone ding. I had a few texts from her husband, updating the family on how she was doing. I signed up for text updates from the race but they never came through (until 1 hour after she finished the darn thing)! She looked so happy and relaxed at Mile 8 and I was so anxious to hear how she did! She ran a super strong and consistent race and I couldn’t be more happy for her. It’s been a crazy training cycle because she’s been dealing with chest congestion and an annoying cough for over a month (not kidding). Her doctor thinks it may be a specific allergy that she deals with at the same time every year but an allergy test didn’t come up positive. The fact that she ran such a strong race with breathing that wasn’t 100% clear is so awesome! I’m really excited to see what you do in the spring, Lin! This is Lindsey at Mile 8, screaming “I think I’m going to PR!!! !” Wahoooooo! 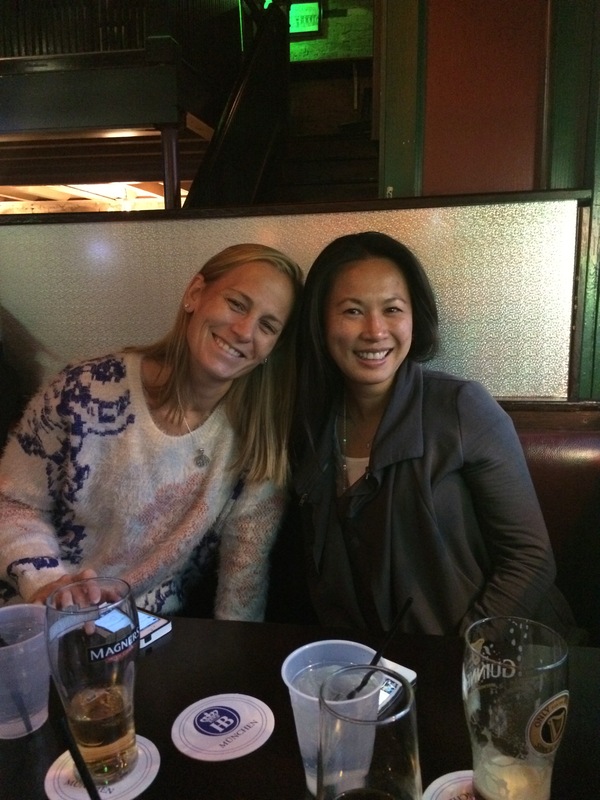 “Brunching” at 2 pm with these two (and Jacq!) normally turns into a long afternoon over a few drinks. It’s the best kind of Saturday. Listening to: Serial! I first heard about Serial on the Slate Culture Gabfest podcast. I listen to a few podcasts off and on whenever I have the time, mostly on a lazy Sunday afternoon or right when I finish up work for the day. The story is already fascinating to me, only 1 episode in and I’ve heard it only gets more intriguing. It’s interesting to hear about people ‘binge-listening’ to this podcast just like they would binge-watch a show on Netflix. Has that ever happened before? I like it. Also, it’s the best kind of listening for an easy recovery spin at the gym. 53 minutes of spin with 53 minutes of Serial. Planning: Our trip to Honolulu! In 5 weeks, my sister Brittany will run her first marathon with Saucony’s #26Strong program! We’ve been talking about and looking forward to the marathon since February of this year and I can’t believe we’re actually planning what we want to do, see, eat, and drink while we’re there! The plan is to run every single mile of the marathon with Brittany, as long as she wants me to. I am in full support of her racing it on her own if she really wants to OWN it. I’ll help her in any way that I can, for as long as she wants me to. My plan is to recover and slowly build some mileage in the next few weeks. I’m taking recovery seriously, now 8 days after 26.2. I haven’t run a single step (except to catch a bus the other day!) since the race so this week I’ll add in a few easy runs with some recovery spins at the gym to get back into a routine. I don’t plan on doing any tough speedwork & my longest run will probably be around 16 miles before we head to Honolulu. Brittany’s training is going so well and I’m really excited to share the experience with her. We nerded out about running Honolulu together when we were in LA for the Competitor photoshoot in July. Note: lots.of.makeup! Also, that’s an interesting facial expression. So, what should we do while we’re there?! AKA, what *can* we do after running 26.2? What have you been up to lately? Doing things you didn’t have time for during training, like me? I felt the same way after chicago. What do I do with my life besides run?!! I bought Leah’s book…can’t wait to read it. Love the promo commercial 🙂 Honolulu will be such an awesome race and it’s so amazing you get to share your sister’s first marathon with her. I love your dining room table! 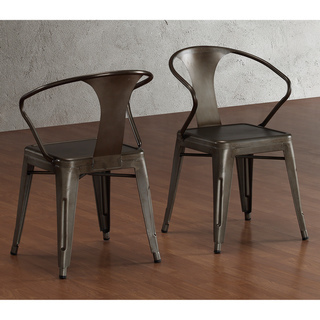 We just moved and need dining room furniture too….I haven’t committed to anything yet though. I love our brunches. I don’t care that I have only a handful of friends. They are the people I love the most! I’m listening to Serial, too! It’s a clever idea, even though I have this hunch that it will conclude with no more particularly stunning info. Unfortunately. I love your chairs, BTW. Hawaii sounds like so much fun!! Hope I’ll be there soon too!